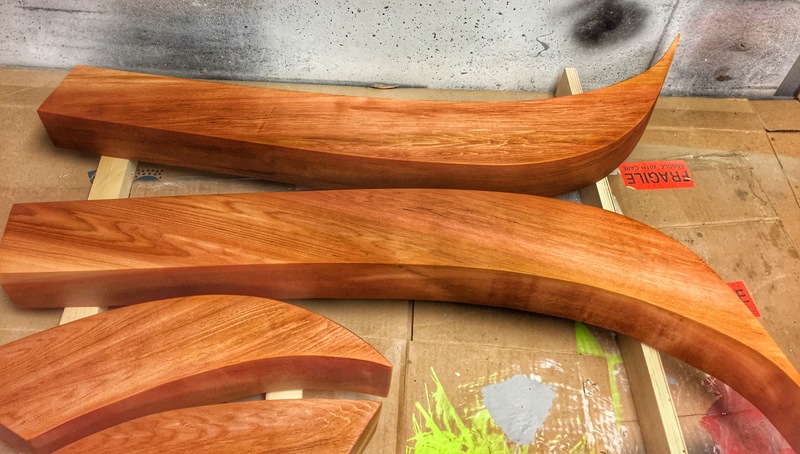 I managed to squeeze an hour in the shop this afternoon to put a coat of spar urethane on the cedar Torch sculpture. The Torch I am sculpting for the Trinity Western House in Fort Langley finally looks a little like a torch. I am so pleased with the natural colours of the cedar and how they are a mirror image on each side. Next I will finish sand all the pieces down to about 280 grit. Then I will put the finish on and mount it to the metal frame. Laying out the pieces on a beautiful piece of western red cedar. I managed to squeeze an hour in the shop this afternoon to work on the Torch sculpture. 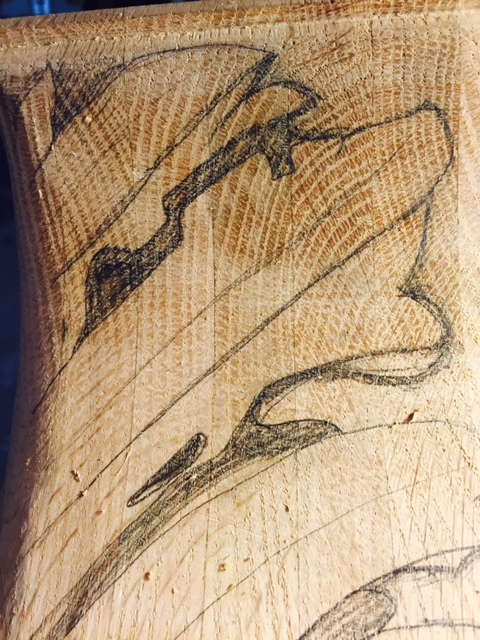 I transferred the various parts of the drawing onto the wood and used the band saw to rough cut the shapes. Once a few of the pieces were cut out, I started sanding them to show the grain. I love the look and smell of freshly milled and shaped cedar! 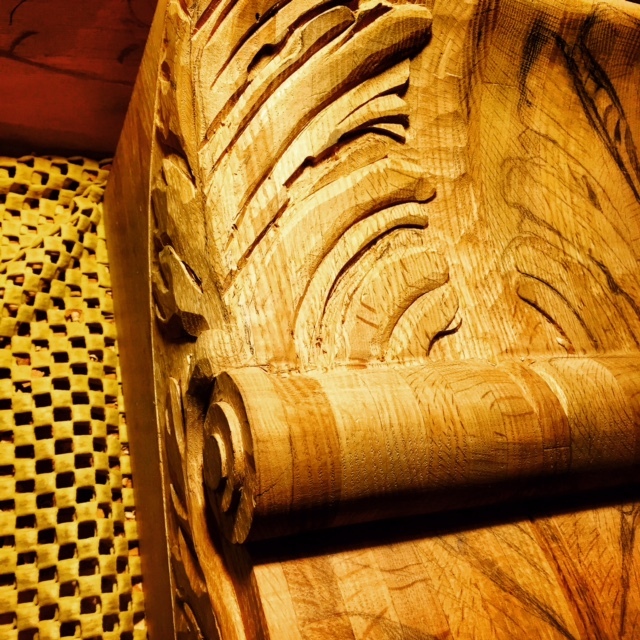 I don’t often wax philosophical in this blog, but as the demand for my carvings has grown so much I am left with the question of why that is so. Why do so many want to buy my carvings or commission me to make a unique carving for them or for a loved one? Why not buy a 3-D printed item? 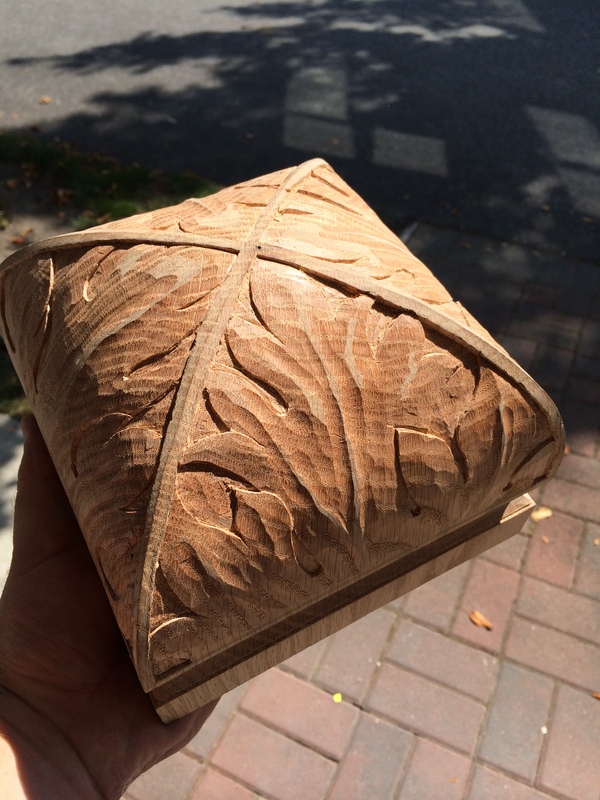 Why am I not in competition with the laser-cut, the CNC machined products? Why am I not afraid of the factory, the reproduced and infinitely replicateable and therefore cheap volume discount products? Letter Carving Seminar Students working hard. In the article, potter David Reid made an insightful comment, “People are looking to have their humanity reflected back at them.” Marshall Mcluhan said that media or technology are extensions of ourselves. We have dreams of perfection, so it makes sense that we want a reflection of that around us. In my mind, this is the attraction of the perfectly linear designs we see in architecture and home decor. These are the brushed stainless or nickel hardware on cabinets, the perfectly flat, shiny, fake stone countertops, the square, linear trim. But there is only so much perfection we can accept. Hence the creepy movies where the psycho bad guy lives in the hyper-perfect world, where everything is crisp white (so white it hurts the eyes) and nothing is ever out of place. I believe we are unsettled by this perfection because we know we are unable to attain it. We know this so well that we distrust any human or human made product that claims perfection. We know the perfect guy in the movie is going to have an evil side – somewhere, buried, so we look for it and we are ready when it appears. The problem with perfection is that it is impossible and when we find the inevitable flaw, it becomes all we can see. It stands out and laughs at our feeble attempts to be something we are not. As I noted in a previous post, David Savage has some excellent points about perfection, quality, and the struggle of the maker. Perfection is cold. It is aloof. It is unhuman. If we want the things around us to reflect our humanity, then perhaps this explains the interest and growth in the handmade. In the article, Fashion designer Steven Alan said, “There is beauty in imperfection and having items that are really handmade.”I agree, to a point. We would not accept an imperfect factory made item. That means poor quality control and uncaring factory owners. No one accepts that. However, we see beauty in imperfection when we know the maker and the struggle he or she took to make something. We love the struggle because we can identify with it, unlike a machine-made product. We want to know that love, care, and attention has been part of the process. My carvings could be reproduced and even made perfect by a CNC machine. But they would cease to have that je ne sais quoi quality, and would have no soul. I believe that art reflects its maker and the viewer. I believe that we want to see the world through the eyes of the artist. I believe that we want to see evidence of love in the art. I believe we want to have a little piece of that love of the artist. This is the appeal of the human, handmade, art. This is the appeal of the craft market, the art studio, the public art, the commissioned piece of art and the craftsmanship we so enjoy. It makes a statement about the world and, perhaps more importantly, about we ourselves and who we are. 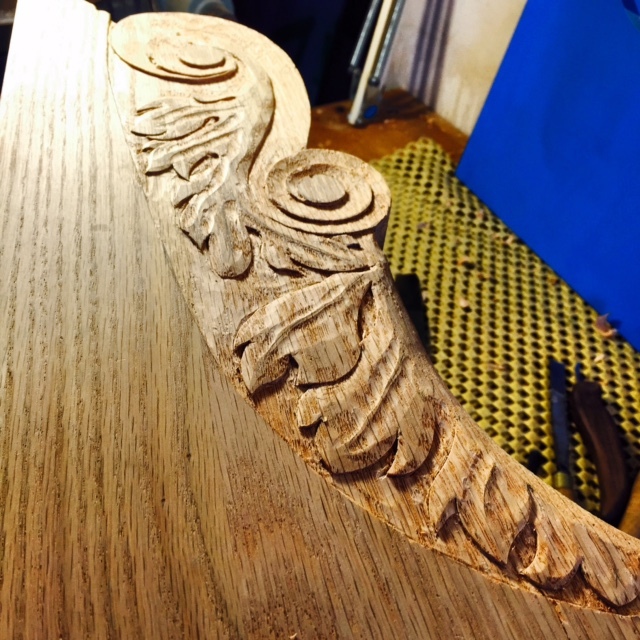 As regular readers of this blog will know, I’ve been carving a pair of corbels in oak for some time now. I’m proud to say that they are complete and are waiting for finishing (stain, lacquer, installation). These have taken a long time to complete from start to finish, so I thought you might like to know what steps were taken to complete these. Dream and vision: the owner of the home has had a vision for his house that spans at least 30 years. He knew he wanted corbels supporting a beam in the entryway for at least that long. The owner and I with our partners took a cruise (ok, it was on BC Ferries) to Vancouver Island, specifically to look at and photograph some of the architectural details in Craigdarroch Castle in Victoria. Several different photos of the corbels in the Castle provided the ideas for the ones I carved (pictured above). The owner’s partner Sandi Stephens drew up the design. The owner’s carpenter, Larry Kwiatkowski, glued up the wood and cut out the shape on a bandsaw. The owner had me rough out the general shape of some of the curves. I argued this was an unnecessary step, but he couldn’t envision the job without me doing this, so I did it (hey, it’s his money). Sandi Stephens transferred the drawing to the wood (also unnecessary, but again the owner…). I roughed out the leaves and stems of the acanthus motif, set the basic depths, and showed the progress to the owner, who approved with a few modifications. I finished the carving to about 90% complete, and took the corbels to the owner for one last chance to make changes. I looked at the other carvings I’ve done for him and determined how to complete the corbels so they would match the rest of the carvings. I completed the carving and spent numerous hours sanding. A helpful sanding product is self-adhesive emery paper, which I cut out and stuck to my fingers, sticks, needle files and just about anything that was the right shape and curvature to help speed up the monotonous sanding. 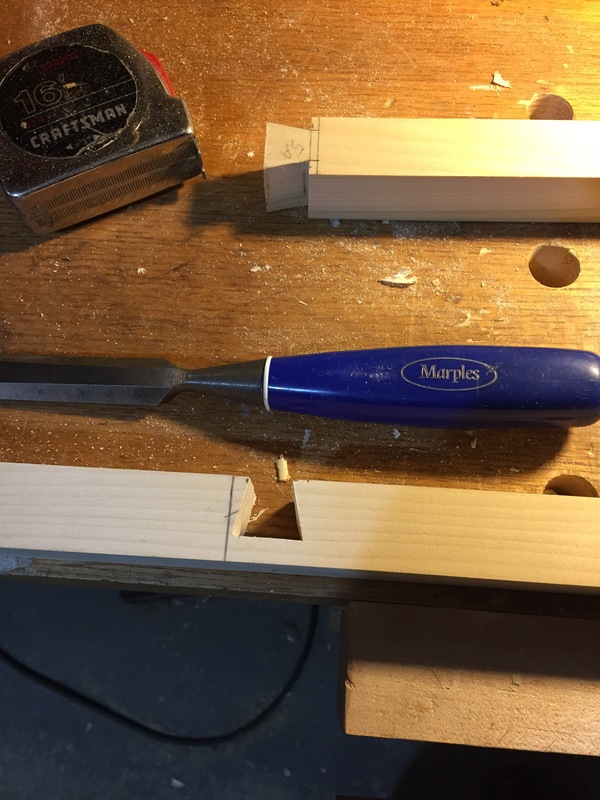 Personally, I hate sanding and much prefer carvings that are finished right from the chisels and gouges, but see my previous comments about the owner…. There are two headblocks to be carved, which will be placed above the corbels and under the beams. Stay tuned to see what they look like. A corbel is a piece of architecture that supports a beam or some such structure above it. Corbels are almost always decorated and often quite extensively. 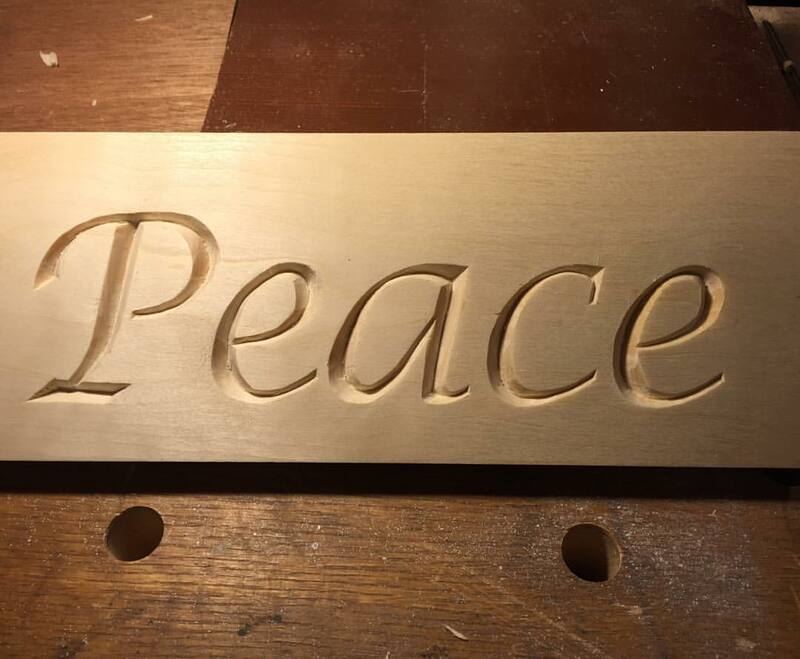 One of my very best clients has contracted me to carve two of these pieces which will sit at the top of a staircase and balcony overlooking the foyer and entrance of the home. They will support a gorgeous oak beam with some traditional Georgian elements to them. This corbel is designed to look like a large scroll with acanthus leaves growing up the front and sides. The acanthus leaves are extensive and richly designed. 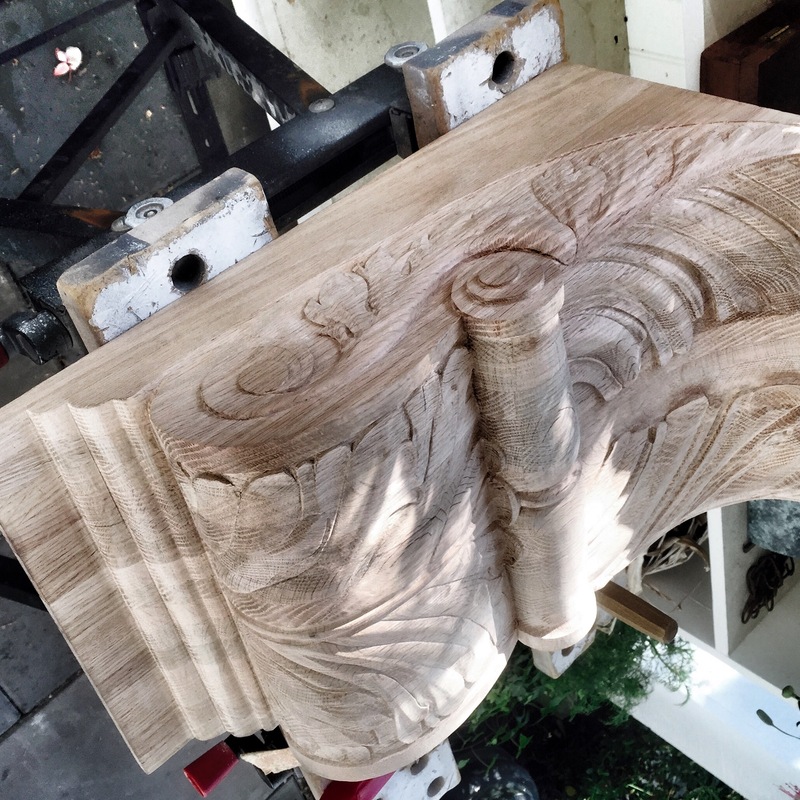 My first task was to carve a curve along the top left and right sides which allows the acanthus leaves to wrap over the front of the corbel like fingers of a large hand gripping the architectural piece. Then I carved the scroll and leaves on the side. 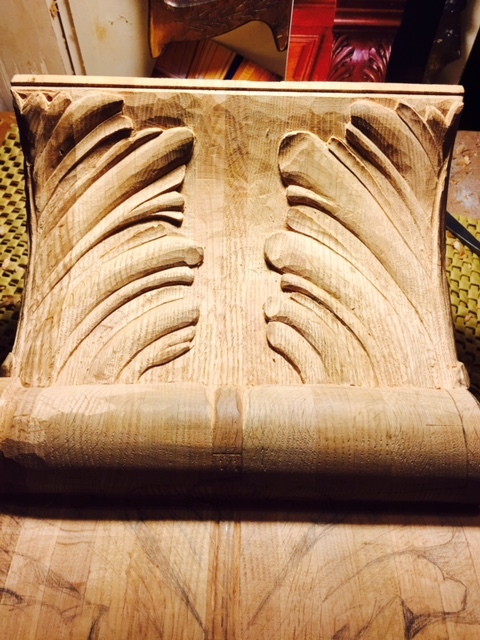 Then I turned my attention to carving the top face of the corbel and those large finger-like leaves curving across. Then my job was to continue to the other side and do the same work. On one side, the leaves curve down to the background, but the other side will curve up and away from the background at the tips of the leaves. Next, i will turn my attention to the heavy bottom of the scroll. 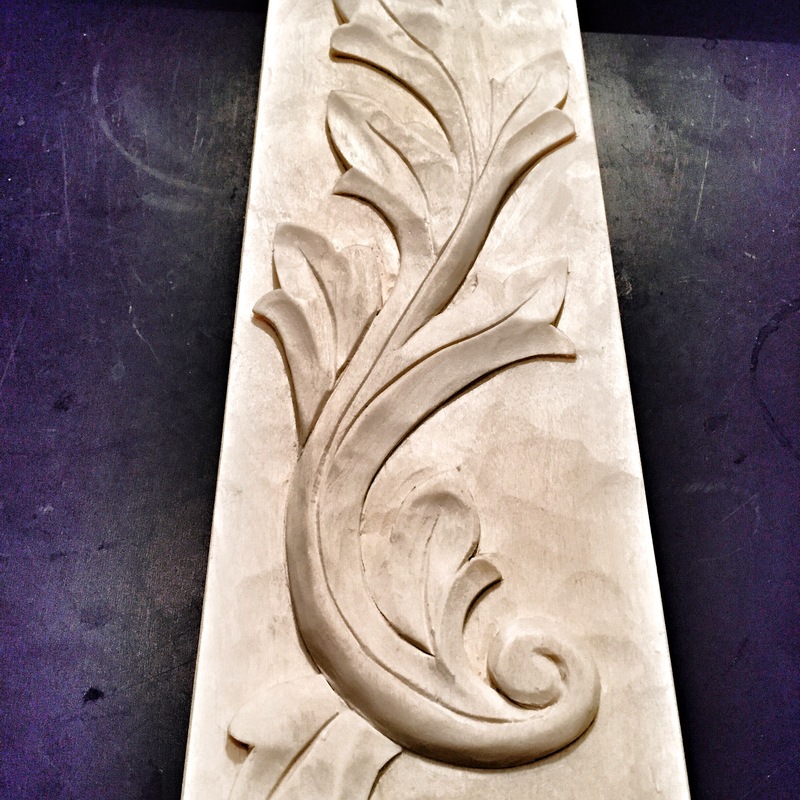 These leaves will be easier to carve because I don’t have to blend them into the side of the corbel. However, the grain of the wood shifts from side grain to end grain as the scroll wraps around, which adds some complexity. The main problem is trying to ensure the carved leaves have enough structural strength to not have little bits vulnerable to being knocked off during the carving process or afterwards when cleaners will be dusting the work. Check back soon to see the progress on the lower half of the corbels. Yesterday I had some fun teaching a woodcarving course at the Coquitlam location of Lee Valley Tools. There were seven students with varying degrees of experience. 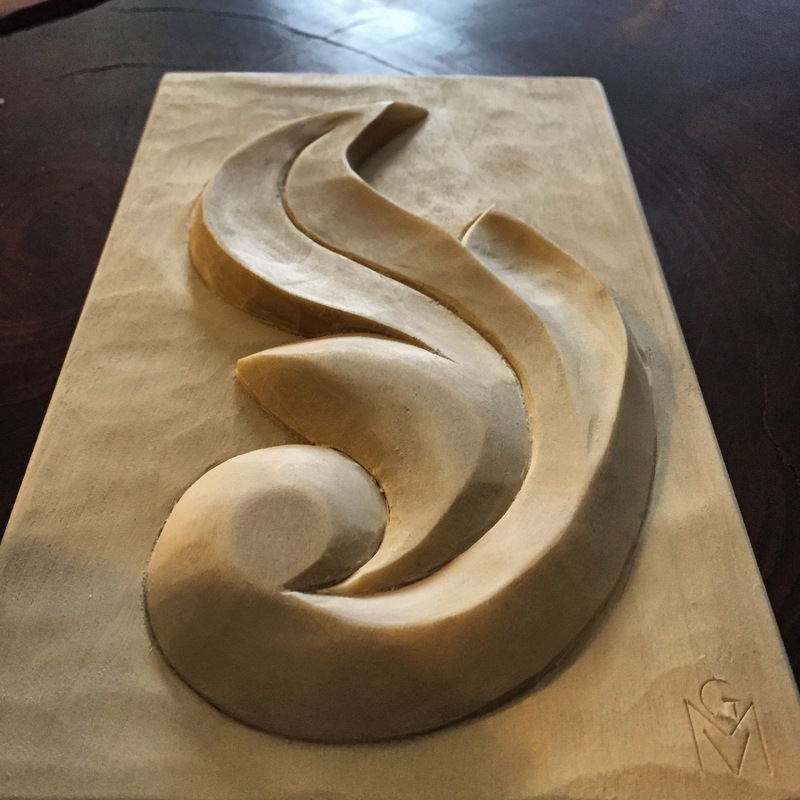 We carved an acanthus leaf in aspen. Lee Valley Tools is doing a good thing with these seminars that teach skills such as wood carving. The participants got to try out new tools and many of them bought one or two that they liked. This will improve their carving experience. We all learned new things, and everyone went home with a mostly finished new piece of art. My own personal favourite carving gouge is a Henry Taylor #3 in half-inch width. Carving in aspen is very nice. It is much cheaper than basswood and is at least as easy to carve. It does tend to fuzz when sanded and can be more brittle and prone to breaking, but it hold good detail especially in a low-relief carving such as this one. I left my card with each participant in the hopes that they will contact me and keep up with their carving. Woodworkers and sculptors have to be a resourceful bunch. The problems we face take a little ingenuity to overcome, which is why I enjoy this work so much. 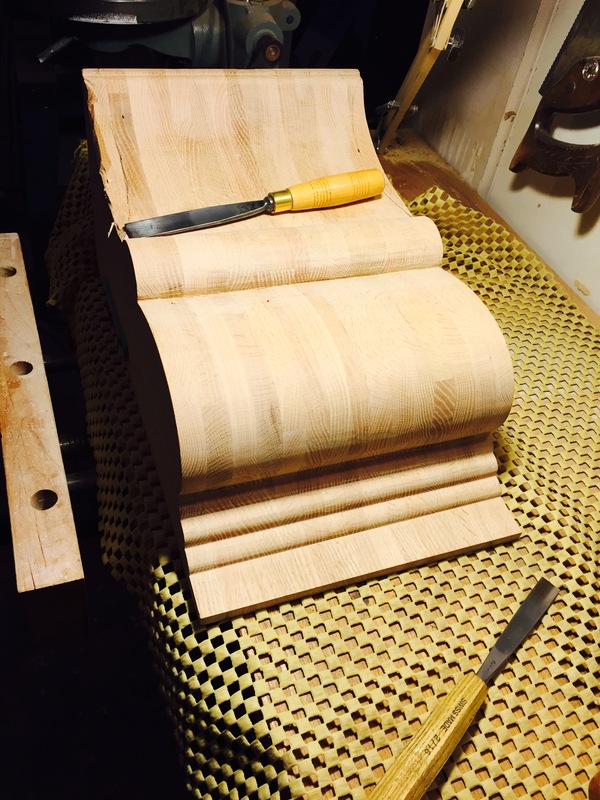 In this case, a client contacted me about carving a couple of corbels for his home. These turned out to be very large – much larger than can typically be purchased from a catalogue of pre-cast architectural elements (I won’t call them carvings because they’re not carved anymore). They were so large that his carpenter couldn’t find a band saw to cut them out whole. Instead, they were cut out in smaller widths before being glued together to make the large corbels. Of course, they weren’t perfect at this point, with some lumps and bumps to be smoothed out and some curves had to be hand-carved before his designer could transfer the drawings on them. Of course I said it was no problem to do this. After all, I solve these sorts of issues all the time for people. How hard could it be? As it turned out, It was harder than I thought. The corbels would not fit in my 14 inch band saw. My hand planes would not work because the design wouldn’t let me get into the corners. Hmm. What to do? 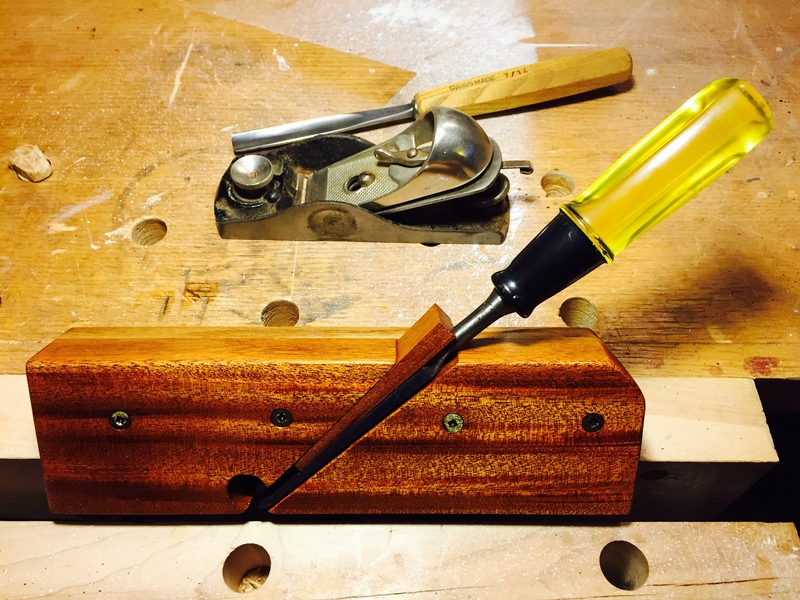 I was fortunate to have a father who was an excellent wood worker and who took great pleasure making jigs to expand the use of his tools and to solve common problems of wood workers. He loved making jigs so much that when I gave the eulogy at his funeral, I said that he was up in Heaven making jigs so God could make more stuff. Taking inspiration from my father, I asked, “What would Vic do? He would make a jig.” Lights went on, ideas were formed and I went to work creating two jigs. The first jig was for my well-loved and very sharp cross-cut hand saw. I set up the jig to control both the depth of cut and to remove any chance of it wandering and creating a waggly line. It was simple and worked like a charm. I used the saw to ensure a uniform elevation of each straight line across the width of the corbels. The second jig was more complicated and took a couple of days to create. In fact, it turned out to be a fairly common form of hand plane, although it was custom fitted to this project. It required some hardwood, epoxy glue, four screws, and some drying time, which is why it stretched out over a couple of days. I needed a plane that would get right into the corners, and yet be large enough to leave a perfectly flat finish over a long span. This chisel plane “jig” worked better than I could have hoped. I designed it so I could insert wedges to change the angle of blade at the mouth of the plane to reach into the corners of an acute angle. That meant I had to grind a straight chisel into a skew chisel to make that happen, but it worked! And one more problem emerged. Somehow, between the three people involved in making these corbels, some dents were made in the wood in some highly visible locations. These needed to be removed. I knew that fitting these corbels into the entire architecture of the location would be challenging enough without sanding down the sides and changing angles and widths, so I didn’t want to do that. 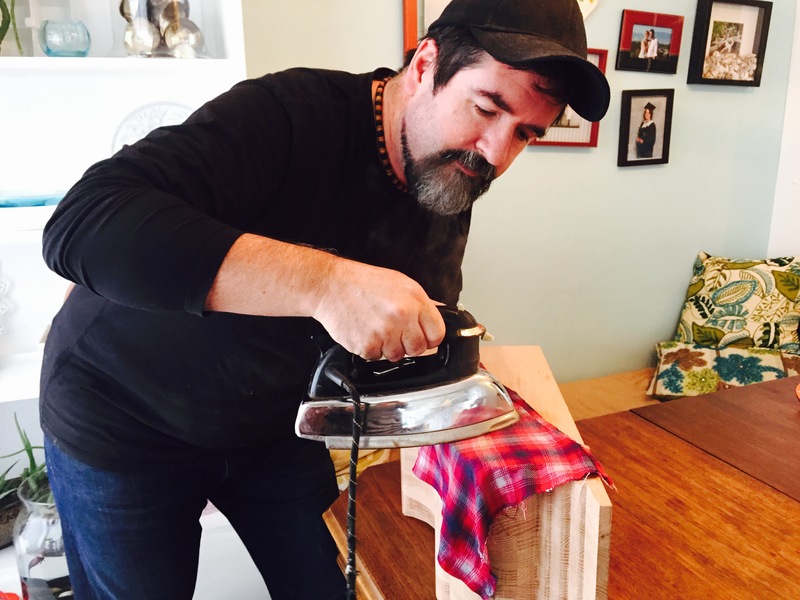 Also, I enjoy wowing clients, so I set about removing the dents with a hot iron and damp cloth – essentially ironing the dents out of the corbels. I deliberately left the pencil marks which would show the client that no sanding had occurred that would change the edges or angles. He noticed and I got a punch on the arm when I said I used a little magic to remove the dents. Now I could begin carving the initial shapes into the sides and corners of the corbels. Happy clients mean more work, and solving difficult problems is what I enjoy doing. It doesn’t hurt to have an inspirational father and a little magic up your sleeve. 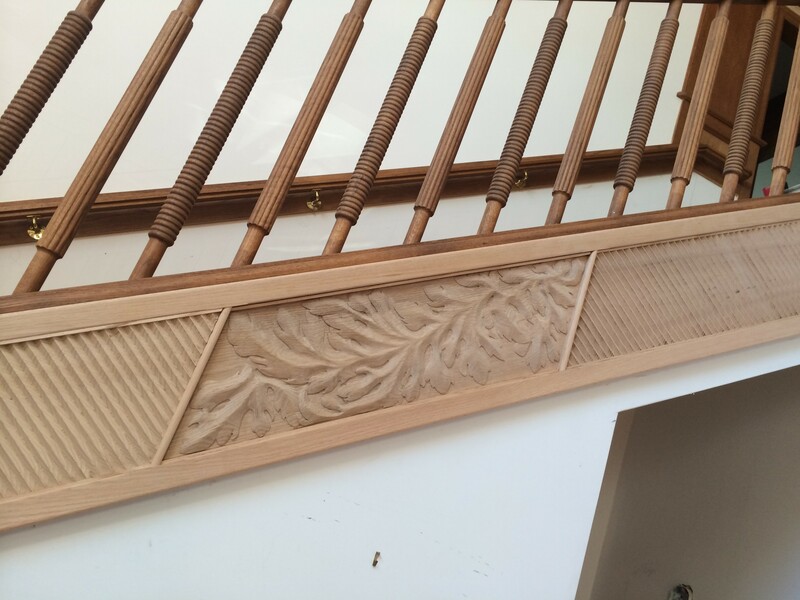 If you’ve been following my blog for a while now, you may be wondering what all those acanthus leaf panels are for and where they will go. They are for a client’s grand entry to his home. The entry is quite large – two stories (ten-foot ceiling stories) tall, and large enough that an eight-foot wide chandelier could be bigger and you wouldn’t notice. 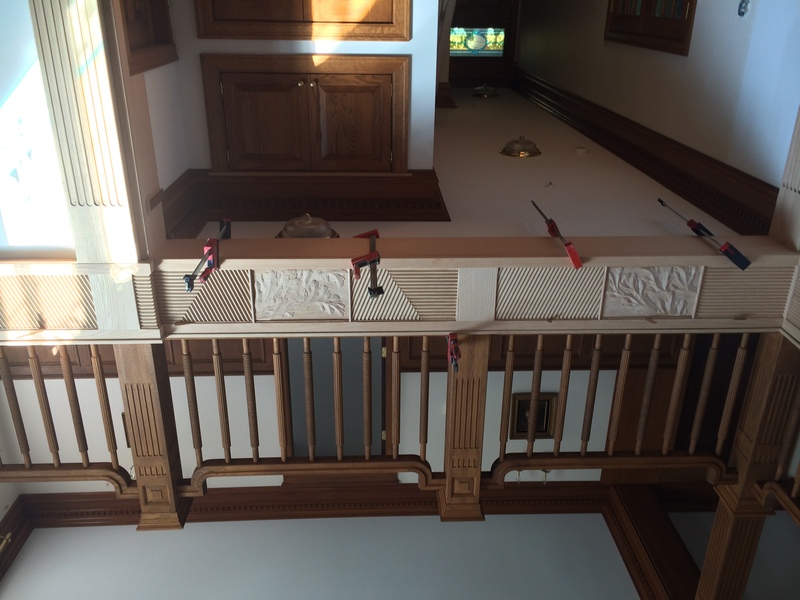 The panels are part of the board that covers up the stair stringer and the board that runs under the handrail of the balcony. 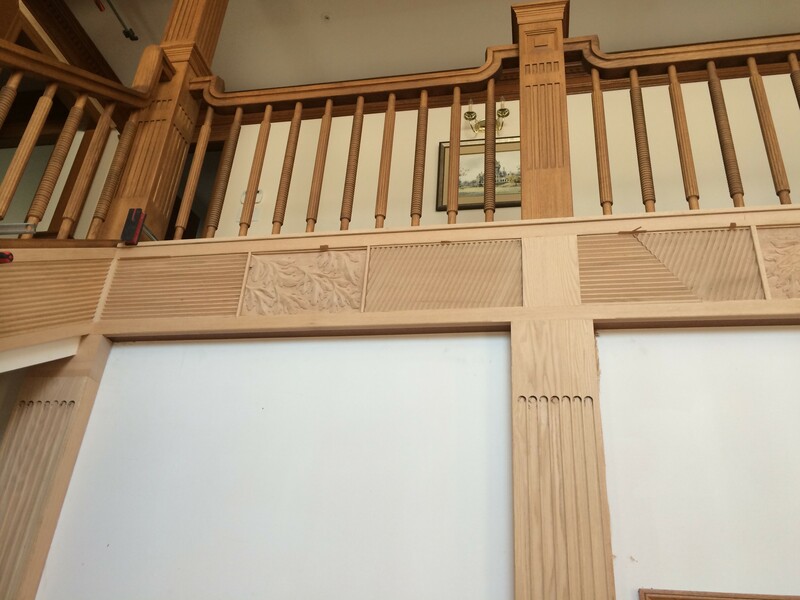 The client called me up to show me the carvings that he had temporarily installed until they could be stained and lacquered. I took a few photos to share with you. But there’s more! The client wanted some finials (sort of an upside down post cap) carved as well. One is a full square, the other is only half of a finial. They are to be installed under his balcony to look as though the post for the hand-rail continues right through to the finial. In the picture below, you’ll see four wood clamps. The full finial is to go between the two middle clamps underneath the post for the handrail with the point of it aiming at the ground. The half finial is to go just to the right side of the 4th clamp on the right. Here’s what the finial looks like mostly finished – there’s still some final smoothing, burnishing, and sanding to do to it. Note that I am holding the finial upside down compared to how it will be installed. 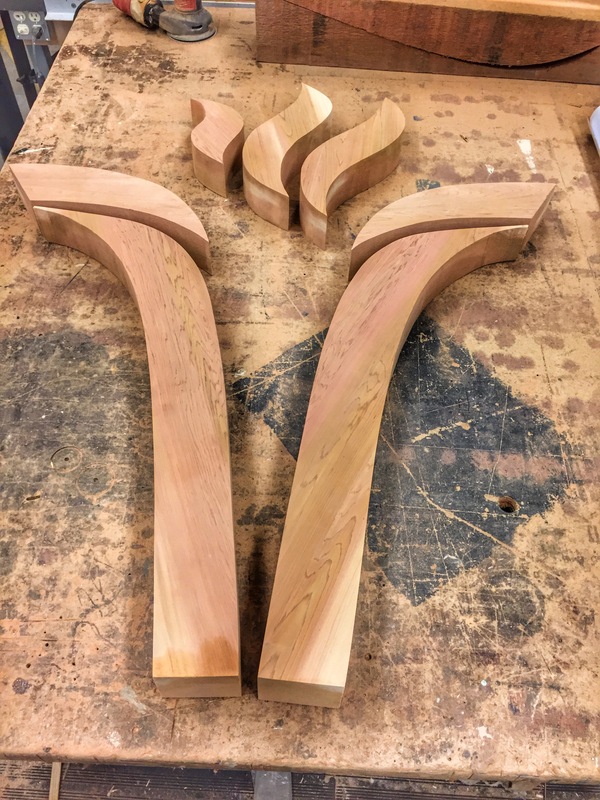 The two finials were quite challenging to carve, as they are primarily end grain after they begin curving toward the point. The design had to be modified slightly because I found that undercutting a point of a leaf to give it shadow meant I was cutting all the fibers underneath the tip that were holding the point in place. They may not have held up under the pressures of sanding, staining and lacquering, so I had to do a little redesigning on the fly. What I like about low-relief carving is that it is basically a trompe l’oeil, so I was able to create a little illusion instead of actually undercutting the leaf tips. The only way you can tell the difference is by actually running your finger tips over the carving. That completes this part of the job and now I can move on to some completely different carving. I’m working on a hummingbird “in the round,” some posts for an entry way to a home, and a large sign complete with trees, ocean, lettering, etc. Sign up to receive an email that alerts you every time I post some new pictures of another project.